Once a social hub for the maritime community in Burnham, subsequently a boarding house and a care home for children and now a private residence once more. Although this building was standing by the time of the Peachey Williams survey of 1838 it is likely it was a private residence of some importance at that time, as it is one of only two listed as ‘House and lawn’ rather than ‘House and garden’ suggesting the owners were of the leisured class. The first reference to the ‘Steam Packet Inn’ is in 1861 when the Licensee is given as John Neck. Throughout the 1860’s it provided commercial accommodation and some stabling facilities. 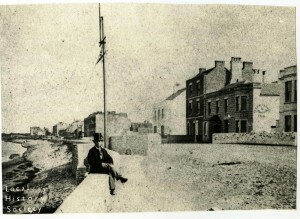 Next door to the Customs House, it was a popular rendezvous for the seafaring community. Sometime between 1866 and 1871/2 it was acquired by Millicent Bowley and began operation as an apartment and boarding house and was renamed York House. In the 20th century it became a Residential Home operated by Somerset County Council. During the 1960’s & 1970’s it accommodated children. Thank you Steve for sharing you memories of these times. John Neck was my 3x great-grandfather’s brother. Can you tell me what the source is for the 1861 ref to him being the licensee of the Steam Packet? I believe he also held the licence for the Pier Hotel at the same time, which I assume is now the Old Pier Tavern? Confusingly it’s from two sources.1861 Census says John Neck and family at The Pier Hotel, which if done sequentially places it on the sea front (Eslpanade). The previous entry is Sea View House and Custom House, both obviously on the sea front Yet in the same year Kellys Directory has John Neck at the Steam Packet Inn. In 1866 the landlord of the steam Packet is James Lever. I also have a town plan of 1852 which shows the site on the sea front as “Pier Hotel”. The same plan has the current Pier Hotel as “Tap” adjoining the Queen’s Hotel. I can send you these details if you send me your personal email. Do you have any more information on John Neck?